Botanical Name: Tectona grandis L.F.
Myanmar teak is considered as one of the best parquet wood material for flooring. 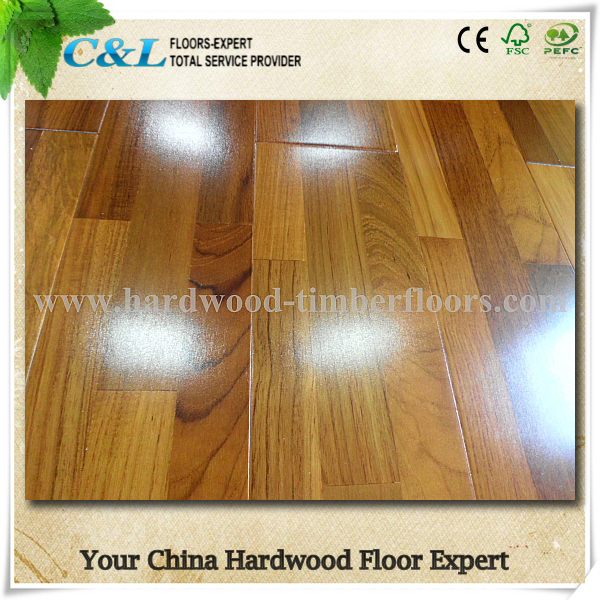 C&L hardwood in China supply solid myanmar teak parquet which is considered the best one among African teak,Malaysia teak and other plantation teak. True myanmar teak with more natural oil inside ,which means even no regular maintaince for the flooring,the wood will still preserve the fresh gloss and natural beauty for many years.It is strongly insect and fugi resistant with natural fragrant smell from inside. People loved so much about true asian teak material,C&L hardwood teak parquet flooring will make your interior decoration fantastic and outstanding! No matter 15mm,18mm or 21mm solid teak floor or 0.6mm,2mm,or 3mm toplayer teak engineered parquets,contact C&L hardwood,youwill find whatever you need from our company. Premier Grade Burma Teak parquet in 18mm is sold more than 120USD/M2,while C&L hardwood factory price is only 60-70USD/M2,contact us for detail,you'll see why we are so advantage in Asian teak parquet flooring!